Friday July 25 Guess all are about as usual, except Mrs Pratt who is still suffering from pain in head &c, & some weakness in her eyes, Kate not so as to be out much yet, but gets out in yard some, I'm feeling miserably from cold in head, Guess Estelle & I made fringe for (tidy's?) not getting down town at all. 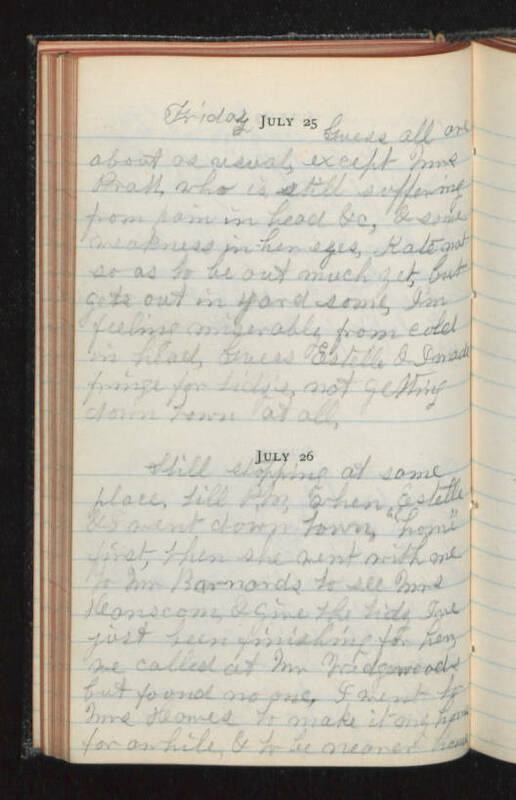 July 26 Still stopping at same place, till P.M. when Estelle & I went down town "home" first, then she went with me to Mr. Barnards to see Mrs. Hanscom, & give the (tidy?) I've just been finishing for her, we called at Mr. Wedgewoods but found no one. I went to Mrs. Howes to make it my home for awhile, & to be nearer home.